The Grahams, the creative union of lifelong romantic partners Alyssa and Doug Graham, combine soulful bluegrass with hints of earthy Americana, adding colors from traditional folk and country blues into an infectious blend of storytelling that results in songs of love, loss, yearning and the view from rural American roads less traveled. Together, the couple spent much time in the secluded Adirondack Mountains where their interests in traditional country and mountain bluegrass would blossom and inspire songs. 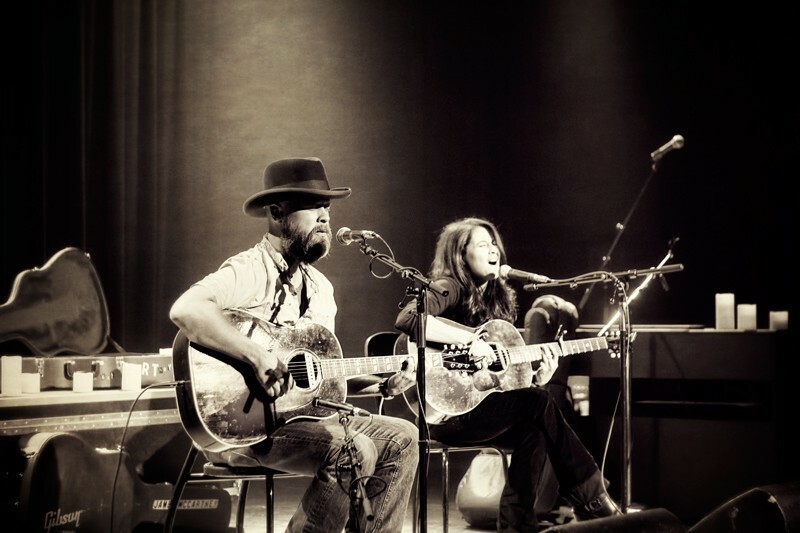 Hoping to share their stories on a wider stage, Doug and Alyssa eventually settled in New York City where they performed, collaborated and recorded a variety of acclaimed material before adopting “The Grahams” moniker, and the new song, “Riverman’s Daughter,” was written. This tale of hardship on the river showcases Alyssa’s bountiful voice and Doug’s cascading accompaniment on the six-string guitar. Last year, the talented twosome literally put their lives on hold and armed with just guitars and backpacks, traveled the 2,500 miles of highways and byways of the Mississippi River from Minnesota to Louisiana. They followed the Great River Road, met the people and heard firsthand where European folk music, brought to these shores generations ago, took root alongside rhythms and chants from Africa and how these polarizing sounds formed the backbone of our 20th Century American musical heritage. The result of Doug and Alyssa’s long journey was the creation of their debut album, Riverman’s Daughter, to be released September 3, 2013. The two are currently in the midst of a tour which began in March and will conclude October 1. Melissa Parker (Smashing Interviews Magazine): Hi, Alyssa! Is your hubby there with you? Alyssa Graham: He sure is. We’re in the car driving from Nashville to Birmingham right now. Let me put you on speakerphone so we can all chat. Doug Graham: How are you? Melissa Parker (Smashing Interviews Magazine): Good. How about you? Doug Graham: Good. Nice to meet you, Melissa. Melissa Parker (Smashing Interviews Magazine): Okay guys, who’s the talker and who’s the shy one? Alyssa Graham: (laughs) Neither of us is shy. Doug Graham: Alyssa’s definitely the talker. Alyssa Graham: I’m the talker. Doug’s more the strong, silent type. But we’ll both participate and try not to talk over each other. Melissa Parker (Smashing Interviews Magazine): Let’s start by talking about childhoods, parents, first interest in music, those types of things. Alyssa, do you want to start? Melissa Parker (Smashing Interviews Magazine): You were born in New York? Alyssa Graham: Doug and I were both born in a small town about 20 miles outside of New York City. Melissa Parker (Smashing Interviews Magazine): Was this a rural area? Alyssa Graham: It wasn’t rural but sort of a bedroom community of New York City. There were no stores except for a small country store called Elmer’s in our town. It was really kind of a lovely upbringing. Kids would be out late at night wandering the streets. It was just a really nice community to grow up in, and we had the access to New York City which was the hub of arts, culture and music and all the great things that come with being close to the New York area. Melissa Parker (Smashing Interviews Magazine): Did your families know each other? Alyssa Graham: Actually, Doug just corrected me. He wasn’t actually born there, but he lived there when he was six. He was born in upstate New York, but his family moved to my neighborhood when he was about five or six years old. Alyssa Graham: Doug was the same grade as my older brother, and they were on little league teams and stuff like that together, so we met very young. Doug will tell you that story of him spotting me for the first time. Alyssa Graham: (laughs) I was probably in the little league stands watching them. Doug Graham: We were both pretty young at the time, so it was very innocent (laughs). Alyssa Graham: He grew up as a friend of my brother’s and eventually my brother and Doug played in a band together in high school when I was still in grade school. So I got to know Doug as the nice guy who played guitar and hung around at my house. My house was sort of the party house, and Doug and I became really good friends when I was very young. Doug Graham: And all through high school. Alyssa Graham: We played in a band together, and we started a love affair that never ended before I graduated high school. Melissa Parker (Smashing Interviews Magazine): Alyssa, your grandfather was an actor? Alyssa Graham: Yes. He was a soap opera star and on a show called The Edge of Night for 25 years. He did commercials and television movies and stuff. But he’s most famous before The Edge of Night because he was one of the first radio voices for programs like The Shadow Knows, Johnny Dollar and all those famous radio shows that came before TV. Melissa Parker (Smashing Interviews Magazine): Very cool. Doug, any show business people in your family? Doug Graham: Absolutely not (laughs). I’m one of the few musicians in my family. My brother and sister had a large influence on me as to my musical tastes. They turned me on to a lot of great music. They’re both older than me. At the same time, my parents didn’t really listen to much music around the house. I wasn’t the greatest student, so when I was pretty young, they handed me a guitar and asked, “Can you do this?” Sure enough, I could. Melissa Parker (Smashing Interviews Magazine): I was reading about your first experience with the music industry which was a disappointment for you. Alyssa Graham: Doug and I started a college band together, and it was pretty successful on the college circuit. At some point, a major music label approached us about putting together a demo and putting out a record. The experience in the studio was not what Doug and I dreamed of. It was more of them cultivating us as the artists they wanted us to be. We were young and naïve and saw it as fun as exciting, but it wasn’t what we wanted. Eventually before they pulled the trigger on the contract, they sat us down in a big meeting and talked to us about choreography and dance elements that they wanted to bring to the table. Doug and I are folk musicians. We’re storytellers, and this was not something we gravitated toward. We told them so, and we declined their offer. That actually propelled me into wanting to go back to music school and get back to the basics and get away from those dreams of fame and fortune, so I went back to music school and really concentrated on songwriting with Doug and developing into the artist I wanted to be, not worrying about the industry. Melissa Parker (Smashing Interviews Magazine): Your music has been called traditional folk/country blues. How would you two describe the sound? Doug Graham: Many times I think of our music, our record, and I think of The Band. I don’t know what category The Band fits into, but every musician aspires to sound like The Band, so of course I’m dreaming of sounding like them. But I feel like our record has a lot of those qualities from the early records. When we play acoustically, there is much more folksy, Carter Family sound we have, so somewhere between folk and country rock or blues and country folk (laughs). Doug Graham: Tried to capture. Alyssa Graham: From that experience and from the music we grew up on which is the early traditional folk and Americana stuff Doug was referring to. Melissa Parker (Smashing Interviews Magazine): Is the song, “Riverman’s Daughter,” based on a true story? Alyssa Graham: “Riverman’s Daughter” was the first song that was written for this record. We were sitting in our New York City apartment on the eleventh floor, and we just had this dream about going down the Mississippi like Tom Sawyer and Huck Finn. Doug Graham: We made up (laughs). Alyssa Graham: That we made up in our New York City apartment. But once we got to the bottom of the Great River Road and ended up in the Atchafalaya swamp, we actually found the guy we were looking for. Melissa Parker (Smashing Interviews Magazine): You must’ve run into some pretty colorful characters on the trip. Melissa Parker (Smashing Interviews Magazine): Does anything specific stand out in your mind? Doug Graham: Wow. Well, there are a few. There’s one great story where we were in Memphis and played a small room there. Upstairs from the venue was a church, a musical church. We got there, and I guess I sort of started helping the pastor move some gear around, move some guitars out of the way because they were practicing in the venue area where we were playing. We became friends, and they just treated us so well. They took us out to dinner and just treated these New Yorkers very well. That’s just one of the stories. Alyssa Graham: It turned out that venue was the first place Johnny Cash ever performed in, so that was interesting to us. I think one of the most interesting experiences for me was when we were down in the swamp living on this houseboat during the 2012 election. We would venture out in our little dinghy that would get us around the swamp to these local swamp bars where people who lived and worked there would go to relax after a long day. We’d get into these really interesting political debates with people from deep south Louisiana, and it was just really interesting to us to meet people that had very different views from us, but we all could communicate and really have an intellectual and nice conversation about what was going on in the world and the election at hand. That was really an incredible experience for us. Melissa Parker (Smashing Interviews Magazine): Nobody got hurt during these conversations? Alyssa Graham: (laughs) Nobody got hurt. In New York, you’re going to get a lot of the same opinions, and it was nice for us to have conversations with people who had completely different reasons for why they voted the way they did and what their understanding of the needs of the country were. It was fascinating and great to meet people that are so different from you yet who you can still communicate with. Doug Graham: As musicians, we can sort of fit into any group of people pretty well because we experience many different kinds of people. We travel all over the world. People have different opinions, and as musicians, people are somewhat accepting of us and almost pity us a little (laughs). Doug Graham: But most of the time they take us in and say, “Tell me what’s up with you.” We love that. Alyssa Graham: We’re fortunate that way that we get to meet many interesting people that are different from us. I can’t tell you that we weren’t frightened those couple of nights that our boat wasn’t going to blow up (laughs). Alyssa Graham: But we got home safe and sound (laughs). Melissa Parker (Smashing Interviews Magazine): Doug, I read that your mother was an inspiration for the album. Doug Graham: Well, my mom was very special. For a long time, she wasn’t really a big fan of me being a musician or that Alyssa and I dedicated a lot of time to music. She wanted me to have a traditional nine to five job. After about ten years, she finally started to acquiesce and started to like what we were writing. When we started writing the first few songs for this album, she just suddenly changed her point of view and was a big fan. We’d go to see her, and she’d say, “Oh, play me that song.” She just became a huge fan. I never questioned it, but it just changed my whole outlook on life in a happy way. Unfortunately, my mother, soon after we started writing the songs for the record, was diagnosed with breast cancer. She passed away last December after we had just gotten off the houseboat. She was very special to me. Alyssa Graham: She was just very special to both of us and was the most selfless, wonderful woman. I grew up with her as well because I’ve known Doug my whole life. She and I had a very special bond that was unusual for a daughter-in-law and mother-in-law. When we got off the houseboat, we went and sat by her bedside for five weeks and basically helped her cross over and played her all the new music. The last thing she was able to say to us right before she was unable to communicate was, “I’ll put a good word in for the new record.” So we have high hopes (laughs). Melissa Parker (Smashing Interviews Magazine): So sorry for your loss, Doug and Alyssa. At least she was able to know what you two had created. Doug Graham: I feel very fortunate to have had that relationship with my mother. Melissa Parker (Smashing Interviews Magazine): I’ve got to ask you if the character Joseph Caine in the song, “Jericho,” is sort of a homage to a character with the same last name in “The Night They Drove Old Dixie Down”? Alyssa Graham: (laughs) We were writing that song (good question, by the way) as we were driving through an area in Mississippi. We actually really loved our time in Mississippi, so it’s nothing against the whole state or anything, but I think it was a subconscious connection to one of our favorite artists, The Band, like Doug said before. We just kept singing the song, and there was no name in place. Finally, we were just singing out loud and somehow that name came out. We said to each other, “Huh. I don’t know whether we can actually use that name to describe this character.” But then we decided it was a tribute to them. Doug Graham: And it came out naturally. Alyssa Graham: So, yes, there is certainly a reference there. Melissa Parker (Smashing Interviews Magazine): The new video of “Revival Time” was just released. Doug Graham: The song came out in Paste Magazine. Presales for the new album are going on now. Melissa Parker (Smashing Interviews Magazine): I saw the photo on Facebook about the video, and Doug had a snake around his neck. Melissa Parker (Smashing Interviews Magazine): So is “Revival Time” a nod to the snake handling rituals in certain Pentecostal churches? Doug Graham: Absolutely. If we could go around and sort of combine the different religions that we saw on our trip down the Mississippi, that’s what the song is about, the joyousness and the differences and the dogma that goes along with different religions. We’re spiritual people, but we chose to play just on the pure spirituality of goodness and try to draw that out in a song, use references to actual churches but not really anything specific even though snake handlers are a very specific sort (laughs). Alyssa Graham: We want people to know that no animals were hurt during the making of this video. Melissa Parker (Smashing Interviews Magazine): As an animal lover, I appreciate that (laughs). You touched on politics earlier. Are you two basically in synch on that issue, on religion, on life in general? Doug Graham: Well, we love the arts, so that leads us down certain roads. Alyssa Graham: You know, we have respect for everybody and the reasons they vote are their own. But Doug and I are in synch. We also grew up differently religiously. Doug grew up technically in a Protestant household, but his family didn’t practice. I grew up technically in a Jewish household, and my family didn’t really practice, but I think that, like Doug mentioned, in spirituality and connection with the earth and the planet are much more important to us than any specific organized religion, although we do have great respect for it. Melissa Parker (Smashing Interviews Magazine): You two are together a lot. Doug Graham: Yes we are (laughs). Melissa Parker (Smashing Interviews Magazine): So Doug, what irritates you about Alyssa? Alyssa Graham: Go ahead, honey. You can answer that (laughs). Doug Graham: Oh my God … well, we’ve been together a long time now. Alyssa Graham: We spend 24 hours a day together. Doug Graham: We haven’t spent the night apart from each other in a long time, let’s just say that. Of course, there are irritations. Of course, there are things that we fight about, but a long time ago, we were able to compartmentalize our arguments into “important” and “unimportant.” Pretty much 99% of our arguments live in the “unimportant” area, so we are able to get a handle on our arguments very quickly. We just say, “Oh my God, that’s ridiculous,” and then within five minutes say that I’m so sorry I exploded because I was highly upset or that I haven’t had a coffee, things like that. Alyssa Graham: Truth be told, everyone in my family calls Doug the diplomat. I’m an Aries and he’s a Pisces, so I’m fire and he’s water. I’m the hothead in the family, and he’s the reasonable, sweet one (laughs). But we always agreed we should be vulnerable with each other. Always let your vulnerability show. Melissa Parker (Smashing Interviews Magazine): You two have traveled all over the country. What are some of your favorite restaurants or coffee shops? Alyssa Graham: Oh my God, we are New Yorkers, so we’re definitely spoiled to the restaurants. Doug Graham: My favorite coffee is On the Fly in Driggs, Idaho (laughs). That’s a really good one. We’re loving Nashville, so we’re heavily into restaurant mode there. Alyssa Graham: Actually our new favorite restaurant is in Nashville. It’s called The Silly Goose. Doug Graham: We love The Silly Goose. What’s that one we ate in Birmingham that we really liked? Alyssa Graham: With my family? Doug Graham: Yeah. That was really good. Alyssa Graham: My dad would know. He’s a big restaurant guy. Doug Graham: It’s on a corner, southern American food. It really was good. All over the country there are a few places we know we can go. Alyssa Graham: Although we end up eating at supermarkets a lot on the road. They have good salad bars (laughs). Doug Graham: There are many Subways in this country; pretty much every stop has a Subway. It gets tiring after a while, so we try out some of the various ethnic cuisines like Mexican or Chinese in a town. Melissa Parker (Smashing Interviews Magazine): Birmingham has many great restaurants. Alyssa Graham: Doug has aunts, uncles and cousins in Birmingham, so we get to spend some time there now and again. It’s beautiful. Melissa Parker (Smashing Interviews Magazine): Yes it is. Guys, what’s the next project? Alyssa Graham: We haven’t come up with what we’re going to do with the next record because we’re really focusing on touring with this music. But we’re always writing, and you can be sure that a new record will be out in probably another year. I think it’s going to be a continuation of this journey because we’re not done with it. Melissa Parker (Smashing Interviews Magazine): Sounds good. I love your music and wish you continued success. Thanks for the fun conversation! Alyssa Graham: If you have any questions or need more info, just email me. Feel free. Nice talking to you. Thanks for your time. Doug Graham: Great talking to you, Melissa!